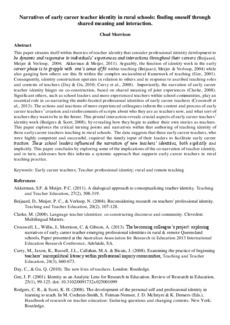 This paper situates itself within theories of teacher identity that consider professional identity development to be dynamic and responsive to individuals’ experiences and interactions throughout their careers (Beijaard, Meijer & Verloop, 2004; Akkerman & Meijer, 2011). Arguably, the function of identity work in the early career phase is to grapple with one’s sense of fit within teaching (Beijaard, Meijer & Verloop, 2004) while also gauging how others see this fit within the complex sociocultural framework of teaching (Gee, 2001). Consequently, identity construction operates in relation to others and in response to ascribed teaching roles and contexts of teachers (Day & Gu, 2010; Curry et al., 2008). Importantly, the narration of early career teacher identity hinges on co-construction, based on shared meaning of joint experiences (Clarke, 2008). Significant others, such as school leaders and more experienced teachers within school communities, play an essential role in co-narrating the multi-faceted professional identities of early career teachers (Crosswell et al., 2013). The actions and inactions of more experienced colleagues inform the content and process of early career teachers’ creation and reinforcements of scripts about who they are as teachers now, and what sort of teachers they want to be in the future. This pivotal interaction reveals crucial aspects of early career teachers’ identity work (Rodgers & Scott, 2008), by revealing how they begin to author their own stories as teachers. This paper explores the critical turning points and narratives within that authoring of teaching identity of three early career teachers teaching in rural schools. The data suggests that these early career teachers, who were highly competent and successful, required the timely input of their leaders to facilitate early career traction. These school leaders influenced the narration of new teachers’ identities, both explicitly and implicitly. This paper concludes by exploring some of the implications of the co-narration of teacher identity, and in turn, addresses how this informs a systemic approach that supports early career teachers in rural teaching practice.